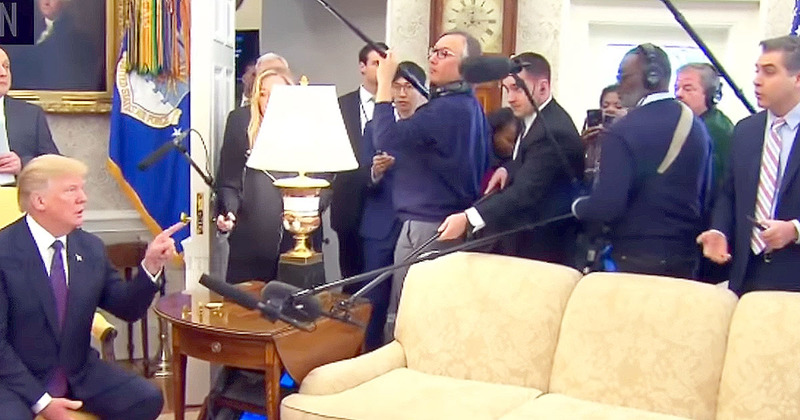 It finally happened, President Trump had a belly full of the rudeness of CNN’s caustic Jim Acosta, and kicked him out of the Oval Office like the cur dog that he is. He and April Ryan should both be banned to the street in front of the White House from now on. Acosta seemed pleased with himself that he was able to provoke a response from the President to his badgering. That was clearly his objective as well as the implied labeling of the President that goes along with asking of derogatory and insulting questions. As President Trump was meeting in the White House with the President of Kazakhstan, he was subjected to the undisciplined attacks of the rogue fake news propagandist just as things were wrapping up. A female voice can be heard thanking everyone, which the civilized among their ranks understand is a polite way of telling them it’s time to leave. Acosta shut his big, lying trap with that and immediately started pushing buttons on his phone. It will be worth noting where both Acosta and his partner in crime, “Toad Girl” April Ryan are positioned in the briefing room in the future or if they’re even allowed in. Civility is expected of the professional propagandists who masquerade as journalists as a prerequisite for attending these functions. Clearly neither Ryan, who shouted at President Trump as he honored MLK, or Acosta with today’s being just the latest in a long history of inappropriate incidences, should ever be allowed near President Trump again. If you’re also fed up with Facebook censorship targeting patriots and America, look for me on GAB at https://gab.ai/RickRWells, and on my website http://RickWells.US – Please SUBSCRIBE in the right sidebar at RickWells.US so that little comrade Zuckerberg won’t be able to keep my posts from getting to you. Thanks for reading my work. It’s a shame the MSM are nothing more than socialist or Globalist shills. I guess it’s the 24hr news cycle. It was much more fair and honest when the news was on once or twice a day and only had time to actually report news. Being a stooge, stupid, and having no shame is a toxic combination. There was once a time in my life, where a reporter, like Jim Acosta, would have been called on the carpet, at his News Agency & fired on the spot, for disrespecting a sitting PRESIDENT!!! It couldn’t have happened to a more deserving guy – can’t wait to see if he’s still seated in the front row at the next briefing. i watched this today, and when Trump just said OUT it was all over. Trump NEEDS TO JUST BAN CNN PERIOD.